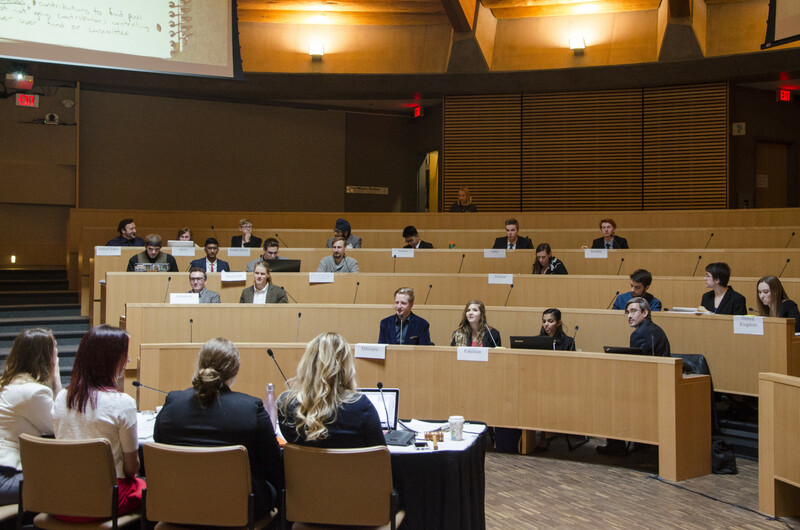 TRU hosted its second annual Model United Nations last Friday. Allowing students from TRU, as well as students from School District 73, to role-play UN delegates in a mock UN committee, the Model UN (MUN) was part of TRU’s wrap-up of IDays. MUN not only gives students a chance to learn about diplomacy and politics, but other cultures and customs as well. Students who want to participate are given two weeks in advance to prepare. Each team, which consists of up to two delegates, are asked to pick three countries they would like to represent, the event’s organizers then decide which team will get to role-play which country. While MUN certainly has an aura of formality, as the assembly must motion every time to move on to a new topic or discussion, overall the event is supposed to be both fun and exciting. “It’s fun to partake and see kind of what international politics are like,” said TRU student and Venezuelan delegate Nicholas Warner. Warner was one of the few delegates present who had previously taken part in last year’s MUN. While last year’s topics included discussions on the morality of drones, terrorism and even the threat of a Donald Trump presidency, this year focussed on sustainable development and poverty. Delegates would have the chance to discuss solutions to urban poverty and slums in the morning, while discussing the South Sudan refugee crisis in the afternoon. In total, the Model United Nations lasted eight hours, with delegates being provided breakfast, lunch, dinner and ample coffee. Much like the real world United Nations General Assembly, many delegates took the roles of their countries to heart and tried to imitate them as best as possible. China and Russia frequently opposed every motion put forward by the United States, and likewise the United States did the same to both Russia and China. Though delegates often shot each other piercing glares of derision, it was all in good fun. While the topics themselves were quite serious, delegates still found time to joke with each other in between discussions. Though the Model United Nations is in its second year, event organizer Casey Helgason admitted that for many of those participating and hosting the event, this year’s MUN was a entirely new endeavor. With the addition of students from North Kamloops, South Kamloops, Sahali and St. Anne’s secondary schools, MUN allows high school students to get a feel for the university environment, while teaching them about diplomacy and multiculturalism as well. Two students from NorKam’s International Baccalaureate program, Stephanie Mosley and Jeevan Randhawa, played the role of Pakistan’s delegation team.